Stem cells and their myogenic derivatives offer unprecedented opportunities to treat degenerative muscular disorders by autologous or allogeneic cell-based therapy. This could be attributed to their self-renewal properties, their myogenic differentiation potential and their capacity to enhance muscle regeneration. In particular, different types of adult stem cells that participate in muscle regeneration have been explored for cell-based therapies of degenerative muscle disorders. Nevertheless, these adult stem cells cannot be expanded indefinitely due to cell exhaustion. To overcome this limitation, bona fide pluripotent stem cells could be used instead, such as embryonic stem (ES) cells and induced pluripotent stem (iPS) cells. They could be induced to differentiate into myogenic cells that contribute to muscle regeneration upon transplantation. Most importantly, patient-derived adult stem cells, ES and iPS cells, have been engineered by gene therapy, primarily using integrating vectors (with γ-retroviral, lentiviral or transposons). This allowed sustained expression of the therapeutic gene in the stem cells and their differentiated progeny. More recently, gene editing strategies have been explored (using either ZFNs, TALENs or CRISPR/Cas9) enabling site-specific gene correction. Proof-of-concept studies demonstrate the potential of gene-engineered adult or pluripotent stem cells for muscle regeneration in preclinical disease models, including Duchenne muscular dystrophy. 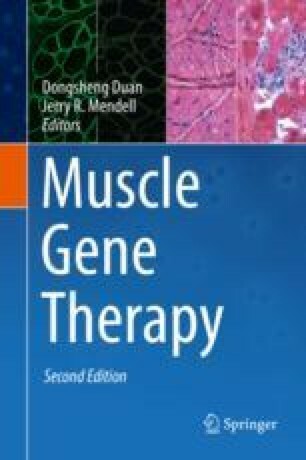 Nevertheless, the overall efficacy of functional integration of gene-corrected myogenic cells into the degenerating muscle would need to be increased. In this review, we discuss some of the challenges that need to be addressed in order to harness the full potential of gene-engineered patient-specific pluripotent stem cells for regenerative medicine. Some of the research described herein was conducted in the laboratories of TV and MC. This research was supported by grants from the Research Foundation of Flanders (FWO), Association Française contre les Myopathies (AFM), Walter Pyleman Fund (Koning Boudewijn Stichting), Willy Gepts grant (Vrije Universiteit Brussel, VUB), VUB Strategic Research Program ‘Groeier’, VUB Industrieel Onderzoeksfonds (Groups of Expertise in Applied Research grant), EU FP7-PERSIST grant and the EU Horizon 2020-PHC-14-2015-MYOCURE grant (Grant Agreement Number: 667751). DB is supported by an AAP mandate (VUB).